This young man was seriously injured in a hit & run accident involving a stolen van. He is critically ill, in hospital and we want to show that our town, supports each other and will continue to do so, regardless of the criminal activity, that is rife all over the country. Two teenagers have been arrested following a collision in Leigh that left a three-year-old boy in a critical condition. Shortly after 10.35am today (Tuesday 30 October 2018), officers were on patrol in Leigh when they attempted to stop a stolen white Ford Transit Connect van on Wigan Road. 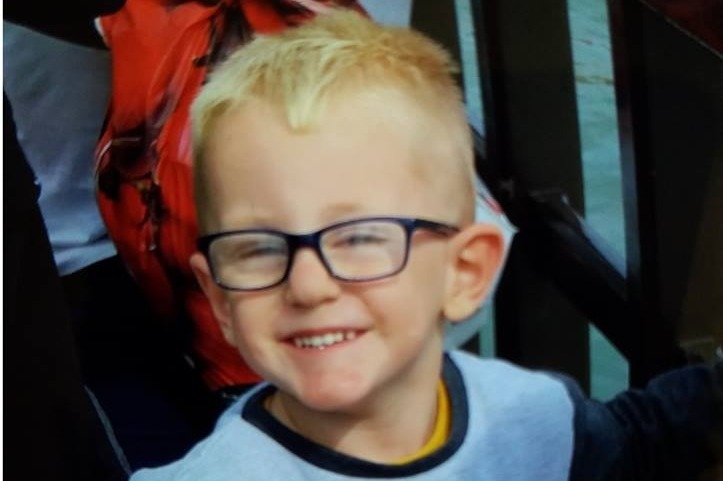 The van failed to stop for officers and during a brief pursuit, the van collided with three-year-old Leo Durrington from Wigan. The van failed to stop at the scene and fled towards Twist Lane. The officers immediately stopped and administered first aid to Leo before paramedics and the air ambulance arrived at the scene. Leo was rushed to hospital with life-threatening injuries and he remains in a critical condition. The van was later recovered on St Johns Street in Abram. On Tuesday evening, detectives investigating the collision arrested a 16-year-old boy on suspicion of causing serious injury by dangerous driving, aggravated vehicle taking, failing to report a collision and failing to stop following a collision. A 15-year-old boy was arrested on suspicion of allowing himself to be carried in a stolen vehicle. The incident has been referred to our Professional Standard’s Branch who have made a referral to the Independent Office for Police Conduct in line with normal force policy. Police Sergeant Lee Westhead, of GMP’s Serious Collision Investigation Unit, said: “Thanks to the quick work of our officers, and information received from the public, we have managed to make two arrests following this horrendous incident earlier today. “I would like to thank everyone who has come forward to police with information so far but our investigation does not stop here, and I would ask anyone with information about what happened to please get in touch with police. The family have great news to announce that as of yesterday Leo was taken off his life support machine and is breathing for himself. There may be a long way to go but thank god and thanks to all for your prayers that we have this positive news to share. Thank you to the public for the continued support and well wishes. On behalf of his mother we have been authorised to give an update. Leo’s mum is at the moment understandably unavailable at the bedside of her critically ill son. However has said she wants to thank everyone for all the support and well wishes and community spirit behind them. She really appreciates everything but cannot face social media at this time. She is aware of all that is going on being Kept informed by her family and close friends. Medically Leo has NOT been diagnosed with brain damage as the rumours heard and false press statement is assumption and not a diagnosis by professionals at all. He is being kept under sedation for now as his little body needs to rest as it’s a lot of trauma to such a small little body. He is showing good signs of fighting back and the family are keeping very positive. Thanks to the Absolute Leigh admin team for setting up the fund page as the response is phenomenal and heartfelt. Thanks for respecting their privacy also. Again thank you to everyone and their prayers.